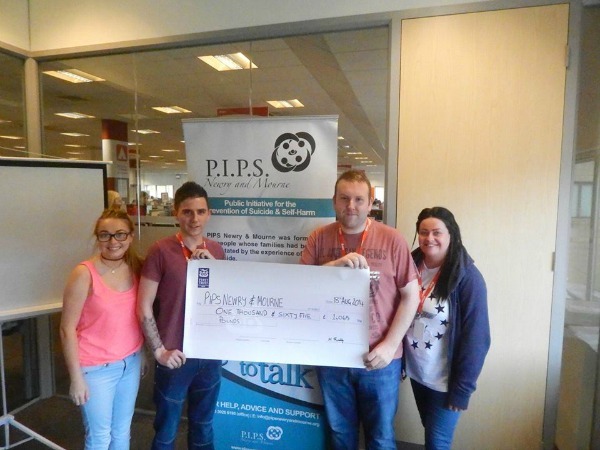 Each year the Eon campaign within Teleperformance hold a charity football match and this year it was agreed that the proceeds would go to PIPS Newry and Mourne. The 11-aside match was held at the Newry Show Grounds on the 5th July through which players and staff raised money through sponsor cards and also a raffle on the night raising a total of £1,065. The whole team from the Eon campaign would like to thank all those who took part in the charity football match, all those who raised money and bought raffle tickets. They would also like to thank Newry City AFC for allowing us to use their pitch and facilities. Thanks also has to go to a number of businesses across Newry who donated prizes for the raffle (Deli-lites, Belleek Living, KK’s Barbers, Waterstones, Lush, Scissors Hairdressers, Turkish Barber Shop and Newry Massage Parlour). PIPS Newry & Mourne would like to give a very special thanks to everybody who participated in the organisation of the event for our charity. It was a great success and we are very appreciative for all your effort. Pictured below is Amy Henshaw from PIPS Newry & Mourne being presented with a cheque from Joe Bennett, Maurice Ruddy and Lisa Morrison from Eon at Teleperformance.